I had the nicest compliment from someone who stopped by my booth at the Vashon Farmer's Market yesterday. She was admiring my cards, and said, "Your work is lovely. It looks as though it really comes from your soul." She was right, you know. "Golden Pathway", for example, was inspired by a magical walk in the forest with my beloved. It was July, and the Madrona trees were dropping golden leaves on the ground. We had just spent a week sailing together, just the two of us, in perfect harmony. This image and the phrase, "walking the golden pathway", has come to mean living in joy, in love, when life is good, when you are in just the right place. 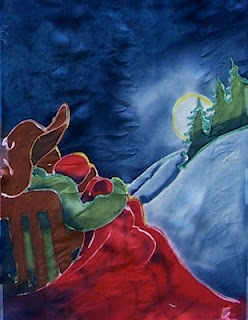 This one, "Grandfather Moon", was inspired by the story Goose Moon by Carolyn Arden. It speaks to me of the bond between grandparents and young grandchildren--something I was just beginning to experience when I created this. 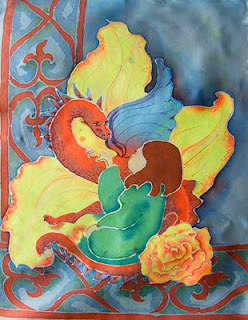 Dragon Lady was inspired by my courageous daughter in law, who gave us a beautiful baby boy in spite of her ms, and by all the women I know who have faced cancer and kept on living with joy and purpose. The dragon symbolizes both what one most fears and our own inner strength. The Dragon Lady has made friends with both. All these paintings are done on silk, and are available at my etsy shop as cards and as prints.